GET PAID TO CAMP? Learn how! 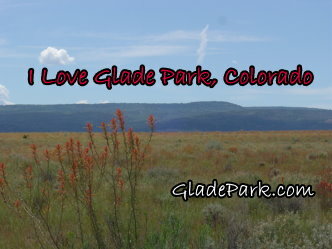 To those who are drawn to the wide open spaces, Glade Park and Piñon Mesa have some great places to camp, hunt, fish, ride horseback or ATV's, mountain bike, or enjoy solitude and take in the scenery. We are surrounded by an abundance of public lands: Colorado National Monument to the east, and McGinnis Canyons Conservation area to the north and west. Bureau of Land Management holdings and a small chunk of Grand Mesa National Forest are inter-woven with private land. This page is a portal to pages dedicated to different outdoor pursuits. Pages will continue to be added. Find the perfect souvenir, gift or memento to capture happy memories of the fun you had on Glade Park and Pinon Mesa. From T-shirts, hoodies, Sigg water bottles, to postcards, you will find what you are looking for. Main BLM Website This section has links to many pertinent pages on the BLM website, to save you the trouble of wading through all of it. You might want to read through first, then see if there is anything you are still wondering about. McInnis Canyons National Conservation Area DO NOT LET THE NAME FOOL YOU! It may sound like it has been set aside as one of those pristine untouchable areas, while in fact, the uses are very diverse. There is some spectacular scenery, containing sand rock arches, only accessible to hikers who are in reasonably good shape. It does include Black Ridge Canyons Wilderness area. But MCNCS also has first class mountain biking trails; horseback trails; OHV trails (Rabbit Valley); Colorado river rafting; hunting (GMU 40 & 30); camping; and paleontology (active dinosaur quarry). And I have probably left something out! Oh yes, there is also livestock grazing. Local ranchers have worked closely with the BLM to forge a relationship that is beneficial to all. Wildlife includes antelope, raptors and other avian viewing, desert bighorn sheep, deer, and elk. The important thing is to go to the website and read up on how to avoid doing something in the wrong place! See more "Stuff You Need to Know" at the bottom of this page. My great-great-uncle Monte Moreland (name is spelled different due to a family rift) was a trapper in the early 1900’s, and also wrote for trapping magazines of that time. He spent time on Glade Park and Piñon Mesa (See: Glade Park Library: Piñon Mesa Bear Farm), but also ranged as far east as Leadville, and west into Utah. His adventures took place in a wilderness that we would now regard with envy… And yet, even then his writing showed acknowledgement that times were changing. He was under pressure to tell the secrets of his trade, and write about the best spots to find fur animals. And he was vilified by readers if it was suspected he was withholding. While preparing his webpage I felt a kinship with Uncle Monte. By providing information on this area, am I contributing to its overuse? I have decided that use is way up anyway, and hopefully I can encourage responsible use of these lands we all love so much. Not many would deny that we have now reached the point where we lack new fields to conquer. Guess we better take care of the ones we have. There is an urge to leave the rules behind when we head for the outdoors. But even the most rebellious outdoorsman knows that toilet paper hanging on a bush just ahead is reasonable cause to change course, and habits. As the population of the area increases, there is increased pressure on these lands, and wildlife. It becomes much more important for all of us to be informed about what is allowed, and where. Areas must be designated for mountain bikers, horseback riders, hikers, ATVers, hunters, and fishermen, so they don’t spoil the experience for each other. Of course each of these areas has different rules for access and use. Private land owners are very grateful when visitors are aware of boundaries, and show consideration by not entering their back yard, at least not without permission. The few who still have grazing permits face increased scrutiny. There are those who make it their life’s work to remove grazing from public lands, in spite of evidence that grazing and the stewardship of ranchers can improve public lands, and certainly preserve open space on boundaries. This is a great benefit to wildlife habitats and migration routes. The Moorland ranch had a grazing permit in Fish Park, where we maintained a water hole and re-seeded with crested wheat. Wildlife also benefited from those improvements. In most cases a ranch’s link to grazing permits is all that makes a cattle or sheep operation viable. Sure, there were some range abuses in the past, when it seemed the frontier was endless and could not be depleted. But that kind of land use faded out long ago. Ranchers are smart enough to know that it just makes no sense to foul your own nest. Considering all these competing interests, the cooperative use of public lands works pretty well, as long as everyone is willing to take reasonable care of the bounty that is here to be enjoyed. Even though rules are a pain, it would be a worse pain to loose any semblance of wilderness. Mosquitos and Gnats! Pinon Mesa has very few mosquito, but it varies, so be prepared with your Deep Woods Off, or whatever you use. There is however a gnat season on Glade Park usually in early June just as is starts to get hot that can drive you and the livestock pretty crazy! Avon Skin So Soft is strangely one of the best gnat repellents. I think Avon is onto this now, and even has a product sold as a bug repellant that has the magic ingredients. The Beautiful Gnat! - a sense of humor also helps!